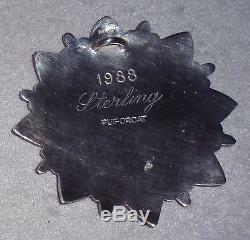 1988 Puiforcat Orfrévre Paris Sterling Silver Ornament. Hallmarked 38 Grams Highest Grade 950 Silver. In 1987, Puiforcat Silversmiths launched a series of annual sterling silver snowflakes with limited distribution that ended with only 2 being issued. 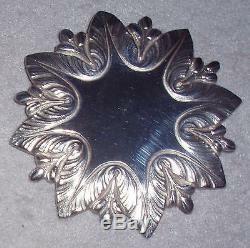 It measures 2 3/4 inches in diameter and is crafted of the finest solid silver. This weighs an astounding 38 grams of solid high grade silver. It is in very good condition. This beauty is hallmarked left of the hanging loop EP for for the famed artist Emile Puiforcat, active in Paris since 1857 at 18, rue Chapon. Above the hanging loop is the word France, and on the right is the French sterling silver hallmark Minerva representing the highest grade of silver 950/1000. Measures approximately 2 1/2 inches in diameter. 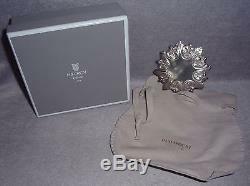 This comes with the original pouch, and original Puiforcat ornament box. There are faint scratches consistent with age, use and polishing and a manufacturing defect on the back. As with all vintage silver, may require proper polishing upon receipt depending on your tastes. This would also be a gorgeous, bold pendant. If by some small chance your item is not satisfactory, your return should still be received within 7 days or less. Be sure to check my other listings for more offerings from Lunt plus many Towle 12 Days of Christmas sterling pendant /medallion / ornament / charms, Gorham, and other sterling ornaments, and more great gift items, Victoriana, Elegant Glassware, Vintage Clothes and Shoes etc. The item "HTF 1988 Puiforcat Orfrévre Paris Sterling Silver Snowflake Christmas Ornament" is in sale since Wednesday, August 14, 2013.